Down-regulation of fibrinolysis and increased fibrin deposition in joints are hallmarks of rheumatoid arthritis (RA), and are believed to be involved in disease progression. The mouse model of collagen-induced arthritis (CIA) closely resembles RA and has been used to explore mechanism and treatments of RA, but neither the fibrinolytic system nor pro-fibrinolytic therapies were investigated in CIA. Plasmin activity, levels of plasminogen activator inhibitor (PAI-1), D-dimer, and IL-6 were measured in plasma of CIA mice. Fibrin deposition and PAI-1 levels were also measured in inflamed joints. Mice were treated with plasminogen activators uPA (urokinase-type plasminogen activator) or tPA (tissue-type plasminogen activator). Effects of treatment on disease severity and fibrinolytic system were assessed. 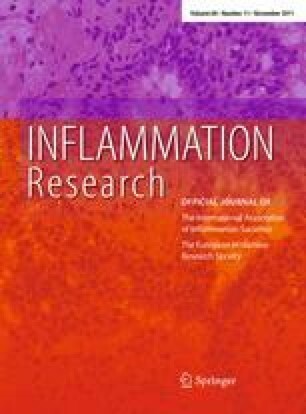 CIA caused decrease in plasmin activity, accompanied by increase in PAI-1 levels, in both blood and inflamed joints. This resulted in massive fibrin deposition in synovium. PAI-1 levels correlated negatively with plasmin activity and positively with IL-6. Treatments with uPA and tPA improved plasmin activity and removed fibrin deposits in inflamed joints. However, disease severity remained unchanged. Fibrinolytic changes in CIA parallel changes in RA, making CIA a suitable model to study fibrinolysis in RA. Normalization of plasmin activity in CIA after treatment with plasminogen activators had no effect on disease severity. Authors are grateful to Malin Erlandsson and Ing-Marie Jonsson for their excellent technical assistance and to Maria Bokarewa for critical reading of the manuscript. This work was supported by Göteborg Medical Society, King Gustaf V:s Foundation, Åke Wiberg’s Foundation, Nanna Svartz’ Foundation, Rune and Ulla Amlöv’s Foundation, Swedish Rheumatism Association, Göteborg Rheumatism Association, The family Thölens and Kristlers Foundation, Tore Nilsson’s Foundation, and the University of Göteborg.